Every week we seem to find something new in the garden that makes a connection to history. This week we were studying the first civilizations in the world and read about one of Egypts leading exports, papyrus, which grew in the Nile delta. Egyptian rulers created a monopoly for this writing material which lasted nearly 4000 years until the invention of paper. Papyrus lost its commercial appeal soon after and the process for making this material into a parchment able to be used for writing was lost for a few thousand years until a scientist/ professor discovered the lost art of Papyrus making. Just so happens we’ve been growing the Cyprus Papyrus plant in the water garden located in the back of our greenhouse for many years, using it as an ornamental. 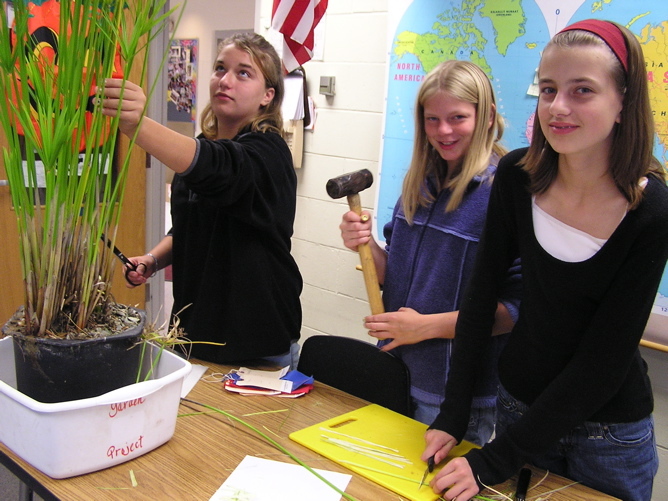 Students brought a few of these plants into the classroom where we tried some of the old methods of working with the papyrus stalks. First we peeled off the green outer layer/ skin before cutting the inner pith into long strips. Next students tried different strategies for preparation such as weaving, hammering and soaking or soaking hammering and weaving until they got the desired product. Since it fiber are so strong the papyrus was also used by the Egyptians for making sandals, baskets and bowls. 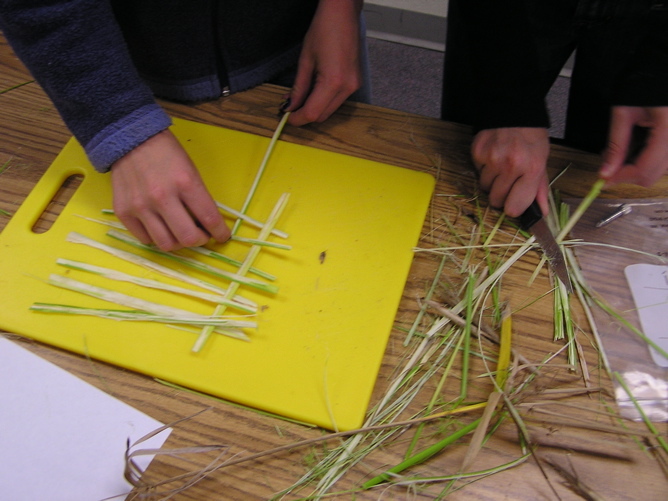 Since our plants were much smaller than the average of 15 feet grown along the Nile, we thought our stalks were better suited for weaving small baskets or placemats. Here the girls show an example of their own Papyrus craftsmanship. The raw material of papyrus paper comes from the plant Cyperus papyrus. This plant was quite versatile and was not only used in the production of paper but it was also used in the manufacture of boats, rope and baskets. The stalks of the papyrus plant are harvested. Next the green skin of the stalk is removed and the inner pith is taken out and cut into long strips. The strips are then pounded and soaked in water for 3 days until pliable. The strips are then cut to the length desired and laid horizontally on a cotton sheet overlapping about 1 millimeter. Other strips are laid vertically over the horizontal strips resulting in the criss-cross pattern in papyrus paper. Another cotton sheet is placed on top. The sheet is put in a press and squeezed together, with the cotton sheets being replaced until all the moisture is removed. Finally, all the strips are pressed together forming a single sheet of papyrus paper.